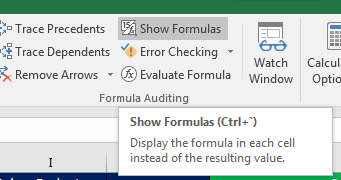 In this week’s blog post, we cover how to show formulas in Excel. This convenient feature is ideal for identifying which cells contain formulas and what those formulas are. John was recently hired in human resources for a large sales firm. His job is to manage the salaries for the sales, accounting and shipping departments. Once hired, he received the following spreadsheet from his predecessor. He was not a fan of the layout and functionality of the spreadsheet. He wanted to change it around to make more sense to him and to give him more control over the data. However, he knew some of the cells contained formulas and moving things around could throw off the whole spreadsheet. However, using the Ctrl+` would result in the same. We at Learn Excel Now hope you now feel confident finding the formulas in your spreadsheet.